As we approach the end of the EJOLT project we like to introduce you to each other and look back to some of our highlights. There are 200.000 of you, who came to our project website. All together you’ve opened 460.000 pages. There’s a good chance that you are from the US, UK, Spain, Canada, India, France, Germany, Belgium, Italy, Australia, South Africa or Brazil as these are the top twelve countries from where www.ejolt.org was opened. The fact that all continents are included in this top twelve, and a total of 220 countries with at least one visitor, illustrates how global the interest in the knowledge of and struggle for environmental justice is. We’ve reported on success stories, like the victory of activists who stopped Mountaintop Removal Coal Mining in Laciana Valley (Spain) and sad news, like the killing of activists that we knew. 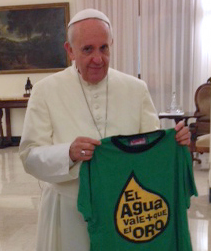 Our most popular blog was about the meeting of EJOLT collaborators with the Pope, who gave us hope by supporting our struggles against fracking and the use of cyanide in gold mining. There were well-read background blogs that gave a whole new look on conflicts that many people care about, like the ones on ISIS and Turkey’s tree revolution. Others focused on the conduct of specific companies, like Unilever and Xstrata and Chevron. Dozens of you have contributed to the blog, making it a vibrant and global environmental justice community with almost 400 blogs since we started 3,5 years ago. We like to express our gratitude for all your efforts to help make this happen. The most innovative, comprehensive and consulted outcome of the EJOLT project is the Atlas of Environmental Justice. At the occasion of EJOLT’s final conference in Brussels we’re launching a set of featured maps on specific issues. More news on that next week. Although EJOLT ends on 15 March, all this information will stay available for many years to come. Different follow-up projects are currently examined so there’s a good chance that the work on bringing us all closer to a better understanding and implementation of environmental justice will continue. In the mean time, we’ll keep some of our channels open, on a slightly lower rhythm: the facebook page and our twitter account. If you want to be sure to get the news on a follow-up project, just keep your subscription to our newsletter or subscribe here if you’re not subscribed yet.